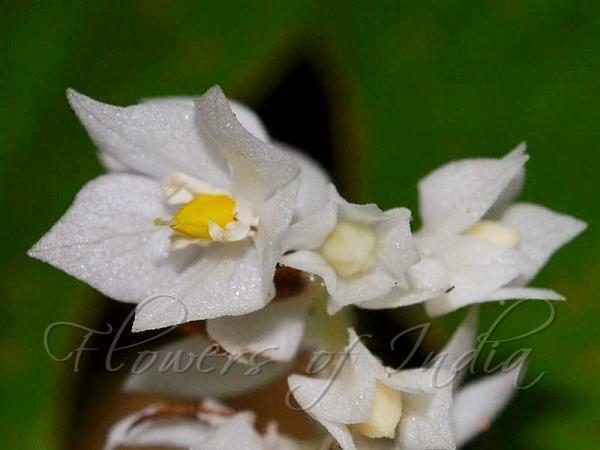 Kerala Neurocalyx is a large, velvet-hairy herb. Leaves are up to 26 x 7 cm, inverted-lanceshaped, pointed at tip, rusty velvety. Nerves are up to 18 pairs, prominent below; stipule 2 cm long, obovate, 2-fid at tip. Flowers are borne in racemes 10-13 cm long, in leaf-axils, rarely branched; bracts lanceshaped. Flowers are white, stalked; sepal tube hemispherical, sepals 5, 8 x 5 mm, ovate; flower tube absent, petals 5 x 3 mm, ovate, twisted; stamens 5, anthers fused into a conical tube; ovary 2-celled, ovules many, style slender. Capsule irregularly bursting, 4 x 4 mm; seeds many, pitted. 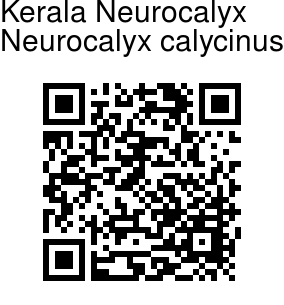 Kerala Neurocalyx is native to South West India. Flowering: May-August. Identification credit: Udayan Punakkal Photographed in Aralam WLS, Kerala.